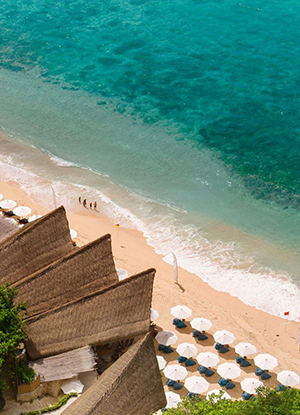 If you’re from somewhere cold and you’re thinking about having a tropical Christmas, then Bali is the perfect place to escape the winter for blue skies, sunshine and coconuts on the beach. The first step is booking yourself some fantastic accommodation. 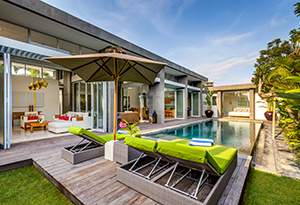 We’ve got a range of stunning villas to choose from but time is running out to book, so if you want to secure the best spots on the island then visit our site here. There’s nothing quite like a Christmas escape to refuel your tanks from a hard year of work. 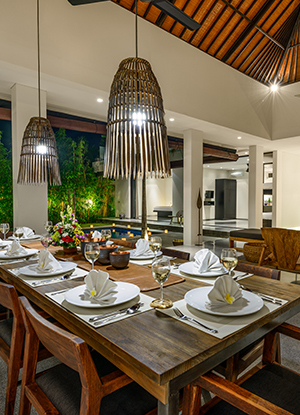 If you fancy staying by the pool and lounging around in your villa then ordering in some food is the perfect option. 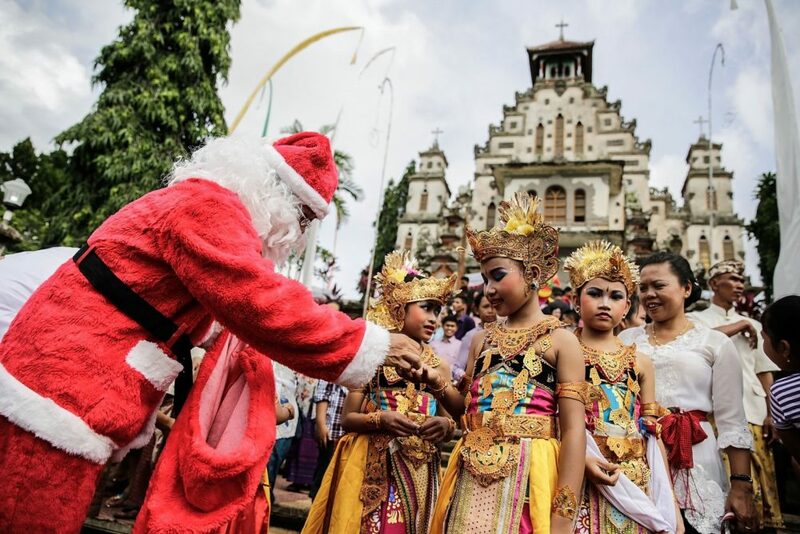 You can have a whole Christmas Feast delivered by the Bali Catering Company and share the day with just your travelling companions. We recommend bubbles, snacks and full indulgence. If you love to cook then don’t worry, Bali has excellent western-style supermarkets with everything you’ll need to prepare your own Christmas lunch. 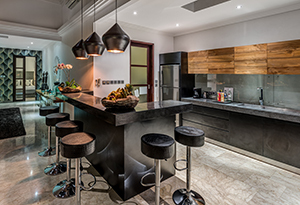 Most of our villas have a fully stocked kitchen so you can bake and roast to your heart’s content. 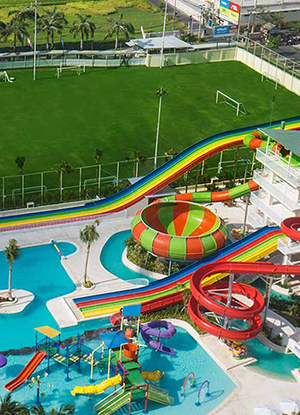 There are so many fun activities to do with kids on the island, but we definitely recommend the water parks at either Waterbom in Kuta or The Finns Recreation complex in Canggu. 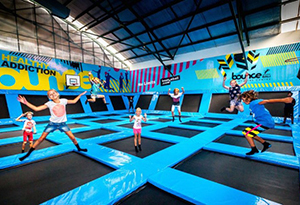 Both of these venues offer different entertainment for the little ones as well as pampering for grown-ups. We recommend hiring a driver for the day and sitting back with a glass of bubbles as you lay under an umbrella and enjoy the service. We love that sense of guilty pleasure of being able to head home instead of facing the post-Christmas day clean up! Now it’s down to the business of gift giving. 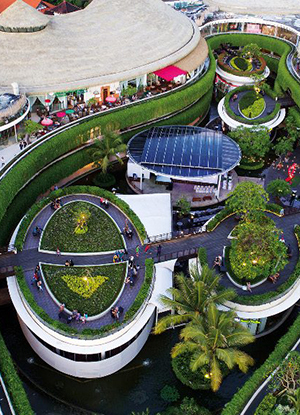 Bali is a shopper’s paradise and there is something for everyone. A menagerie of shopping can be found, from one-off designer items to market gear. If you cant find it, have it made! 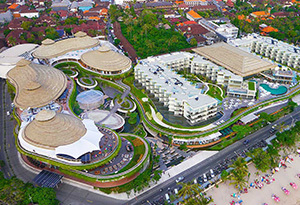 For some have-it-all shopping centres, try Bali Beachwalk or Discovery Mall. 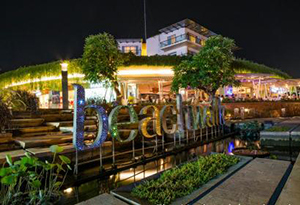 For the youngsters you can head to beachwalk to enjoy Christmas carols, visit Santa Clause, and attend a kids fashion show. And just like home, don’t forget that you can also dash over their for the Boxing Day sales! If malls aren’t your thing, explore the multitude of flea markets in Bali and see what you can haggle. Spoil the ladies at a nice home deco and furnishing shop such as Piment Rouge, Kemarin Hari Ini or Bagatelles. 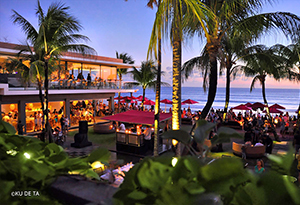 When you want to get away from the crowds and head back to nature, we recommend heading south to do Christmas in Uluwatu. You’ll be surrounded by soaring limestone cliffs and close to the most epic surf beaches on the island. If you’re here for the waves, then we recommend staying in one of our villas out that way Karang Saujana then getting up early on Christmas morning to head out for the first swell of the day. Being in the warm Indian Ocean as the sun rises is an amazing way to celebrate Christmas Day in the peace and beauty of nature. 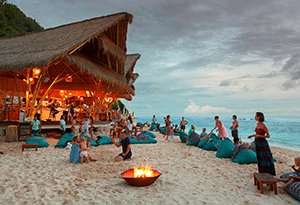 Later in the day, we recommend you visit the exquisite Sundays Beach Club. It has a stunning restaurant, a private beach and lots of options for exploring the coast. You can try paddleboarding, snorkelling and enjoy the live music after sunset. 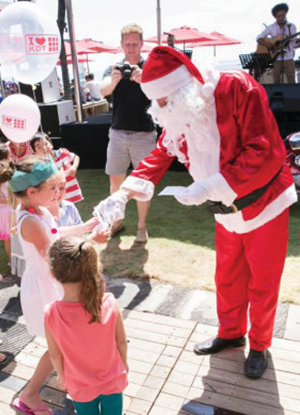 On Christmas day they usually have a bonfire and a visit from Santa to keep the kids happy. 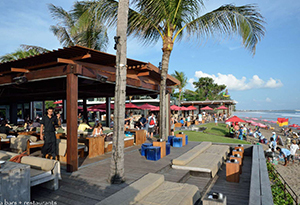 There are so many great restaurants in Bali, oh my! 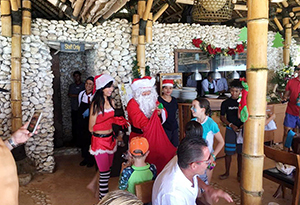 We found it hard to recommend just one, but KU DE TA offers a four-course Christmas lunch that we’ve enjoyed on more than one occasion. It’s a famous beach club so you can expect to have space to lounge by the pool, enjoy the beachfront or sit down for a more formal feast in the restaurant. We don’t know what the menu is yet for 2018, but last year they had Danish ham, Moroccan style swordfish and Christmas pudding to die for. Santa usually appears with little gifts to make you smile, and their wine list is a treat. 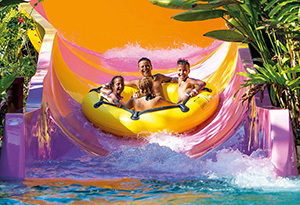 The relatively low cost of living and the beautiful climate make Bali an excellent option for a Christmas holiday. Make sure you take a look at our villas and book one before they’re all taken – and do stay tuned as we’re doing our research this week on the best place to buy Christmas presents. Whatever you end up doing for the holidays this year, we wish you the good health and good luck!